Songwriter, performer and actress, Felicia Lily ‘Fefe’ Dobson took lessons at Toronto’s New Conservatory of Music in Agincourt to improve her singing, and later attended Wexford Colligate Institute for the performing arts in Scarborough. She was offered a record deal at 16 with Jive Records, but turned it down because Jive wanted to groom her for pop and R&B, whereas she wanted to sing rock ‘n’ roll. 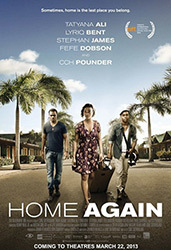 She made the move from music videos to movies in 2012 and is pictured above in a still from Home Again.